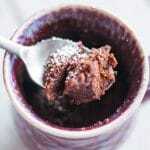 Ready in less than 5 minutes, this delicious chocolate mug cake recipe is made using the microwave. A complete game changer! Mix flour, sugar, and cocoa powder in a large cup. Add egg and mix into the flour mixture (don’t worry if it doesn’t mix in completely). Pour in the milk, oil, and vanilla extract. And mix well. Add chocolate chips, mixing a few in the middle/bottom of the cup, while letting a few stay near the top of the mixture. Place the cup in the centre of your microwave, cook on high for 1 ½ – 2 minutes (depending on your microwave). Enjoy! You can use All-Purpose flour too. In many cases, this will rise out of the top of cup or mug. So be sure to use a large one, or a microwaveable bowl if you don’t want that to happen! Pro Tip – for super easy clean-up, butter the inside of your mug before starting. Super Pro Tip – if you want to go for a slightly more crumbly cake, use a small egg instead.